July 23, 2014 - "New Product Release"
Pop the top off and ctach the cap in one single-handed action. 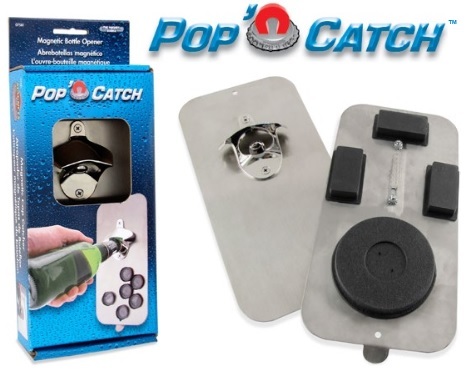 Castle Rock, CO July 1, 2014 – Master Magnetics, Inc (The Magnet Source®) introduces an innovative new product: Pop ‘n Catch™ magnetic bottle opener. Just in time for the summer selling season, the Pop‘n Catch™ magnetic bottle opener and cap catcher is the convenient bottle opener you can take anywhere. 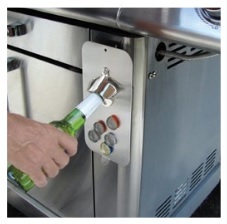 Whether at home, tailgate parties, picnics, or camping, instead of having to look around for the bottle opener, just pop the bottle top and catch the cap in one single-handed action. Magnetic or screw mount. Four powerful, rubber-encased magnets for scratch-free magnetic mounting on refrigerators, outdoor grills, tailgates, RVs, toolboxes, and metal coolers. Screw mount to decks, walls and more. Magnets catch and collect the caps on the face for easy clean up. Heavy duty, stylish, brushed stainless steel construction. Customize with your own favorite team logos or sayings. "We're excited to introduce this innovative and universally usable new product," sad Master Magnetics' sales manager Jim Madsen. "Everyone has indoor and outdoor events where the Pop 'n Catch is convenient and fun to have around such as parties, camping or tailgating. But remember wherever you got with it, please pop and catch responsibly," advised Madsen. Visit magnetsource.com/cheers for customized ideas, logos, and loations to bring the Pop 'n Catch. Founded in 1976 and located in Castle Rock, Colorado, Master Magnetics, Inc. manufactures and distributes all types of magnets and magnetic devices for commercial, consumer and industrial use. The Magnet Source® brand is a trademark of Master Magnetics, Inc. and represents exceptional quality, expertise and customer service. For more information, call 1-888-293-9190 or visit www.magnetsource.com.